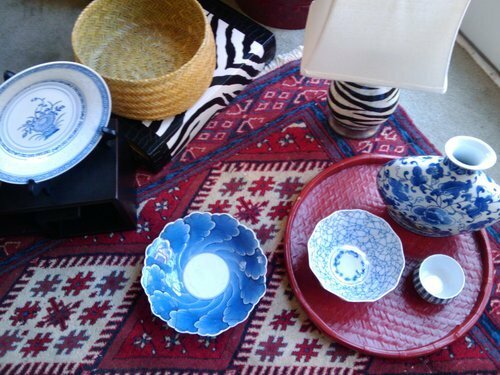 ebra, warm cinnabar red, fresh blue and white Chinese porcelain. Whoever said these things go together? Well, they do. My colleague’s office redecoration continues - along with the color story that she loves. She wanted a new rug, one that was a little less busy, so I found a vintage hand-woven rug with the same color scheme, yet a bit toned down. Next steps: to style her three tall, dark wood bookcases. I’ll use the items pictured that I sourced at antique, thrift and bargain stores. Watch this blog for tips on how to bring a color story all around your room.